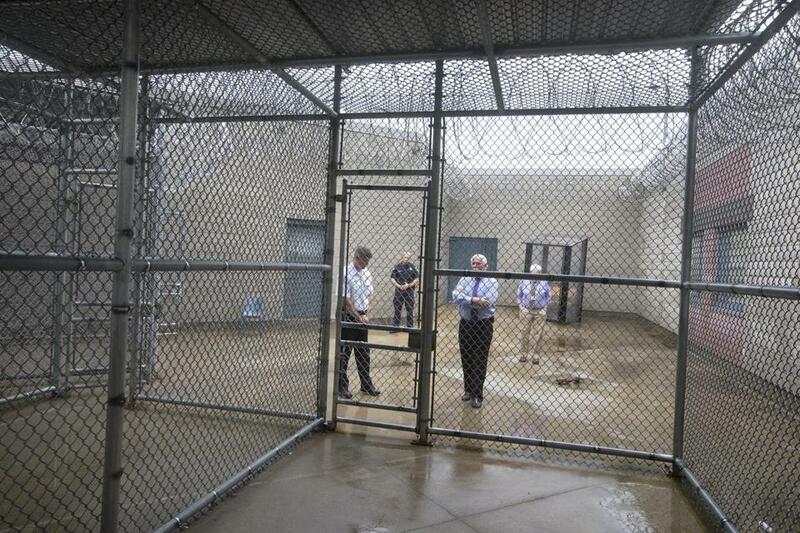 Sheriff Thomas Hodgson, third from left, stands in front of the exercise cage at the Bristol County House of Corrections. This week’s election of Rachael Rollins as Suffolk County district attorney is the latest milestone in a nationwide campaign to overhaul the criminal justice system by changing the face of one of its most powerful actors: the prosecutor. Over the last couple of years, national donors like George Soros have joined with local activists to elect reformers in places like Corpus Christi, Chicago, Philadelphia — and now Boston. The work is incomplete; even as Rollins rolled to victory this fall, several promising candidates backed by Soros and other national advocates lost district attorneys contests in California. But if activists continue to press for change in the prosecutor’s office, they’ve got to target another important elected official too. The next frontier in the criminal justice reform movement is sheriff elections. Joe Arpaio , of Maricopa County in Arizona, offered a vivid tutorial on how bad a sheriff can be. He forced some inmates to wear pink underwear and put others on bread-and-water diets. He paraded them around his jail in shackles. Prisoners in an outdoor “tent city” endured temperatures so extreme that they said their shoes melted. And he wasn’t just an awful jailer. He was an awful law enforcement officer, too, allowing investigations into sexual assault to languish as he pursued an attention-grabbing crackdown on illegal immigration that relied heavily on racial profiling. Massachusetts has a Trumpian sheriff of its own, Thomas Hodgson of Bristol County. He’s best known for offering to send his inmates to the border to build the president’s wall. But he’s also faced lawsuits over exorbitant fees for prison calls and the placement of severely mentally ill patients in solitary confinement for 22 hours per day, without treatment. Hodgson and Arpaio both have ties to the “constitutional sheriffs” movement, a collection of some 200 law enforcement officials who make the odd claim that sheriffs — not the federal government — have final say on constitutional matters in their counties; Hodgson once paid dues a constitutional sheriffs group, according to a campaign finance filing. The movement started with William Potter Gale, a California minister who preached Christian Identity, a belief system riven by anti-Semitism and white supremacy. In a 1971 edition of his newsletter, Identity, the all-caps happy Gale declared the county sheriff the “ONLY LEGAL LAW ENFORCEMENT OFFICER IN THE UNITED STATES OF AMERICA!” and urged the formation of posses to support their work. Posses sprouted all over the country, and some of them were quite aggressive. One attacked an IRS agent in Wisconsin. Nowadays, constitutional sheriffs take defiant stands against state and federal restrictions on guns — sometimes refusing to enforce them. And at least three showed up to support the radical Bundy clan during their high-profile standoff with federal officials in Nevada over grazing rights. Many of these sheriffs serve in deeply conservative counties and could be difficult to dislodge. But there are plenty in politically mixed jurisdictions. Hodgson’s Bristol County, in southeast Massachusetts, went for Hillary Clinton in 2016, even as he ran unopposed. Arpaio’s defeat, that same year, is especially instructive. His was one of the few sheriffs’ races in memory to attract substantial outside money, with Soros spending $2.3 million to oppose him. Those resources, combined with sharp opposition from Latino voters and declining support from moderate Republicans, spelled the end of his circus-like tenure. Sheriff races aren’t just a chance to get rid of misguided law enforcement officials, though. They’re also an opportunity for reform. Here in Massachusetts, Middlesex’s Peter Koutoujian has shown what a creative, forward-looking sheriff can do — creating standalone units in his jail for veterans and young adults, with a heavy focus on rehabilitation. Criminal justice reform is about changing the laws on bail and sentencing, of course. But it’s also about changing the people at the levers of power. The prosecutor’s office was a smart place to start. Now, it’s time to take on the sheriffs.